A Candlelight Farms Inn Wedding is held at a private estate on Candlewood Mountain in New Milford, Connecticut. The 1843 inn has welcomed guests throughout the years who have all enjoyed the gracious hospitality, cozy rooms and panoramic views of its 600 acre property. The venue offers gorgeous views of rolling hills, towering mountains, and serene ponds. A Candlelight Farms Inn Wedding can be held in the newly renovated “Lower Barn”, which has a dance floor and is able to seat up to 80 guests. 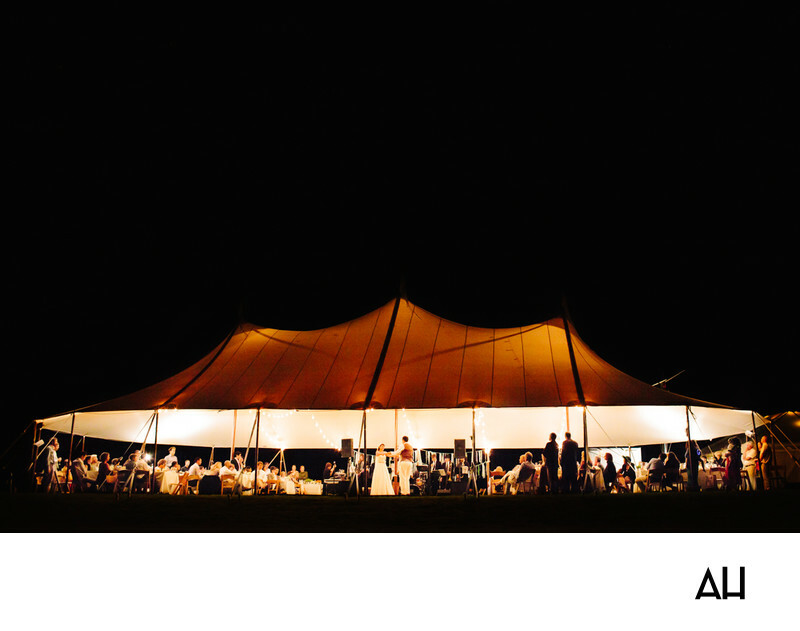 For larger wedding events like the one pictured, couples may need to rent a tent to accommodate more people. The tent in the photograph is filled with guest who have come to witness the celebration of love between this bride and groom. At the center of the dance floor the groom swings his bride as the band plays and the couple enjoys their first dance. Guests look on in adoration, reveling in the sight before them. The newlyweds glow at the heart of the celebration and break up the darkness of the night. Also illuminating the evening are the lights strung across the ceiling of the tent. These lights give the impression that thousands of little fireflies are flying above the couple and their guests, shining down on this precious moment.